In need of bike lights for bike parties? 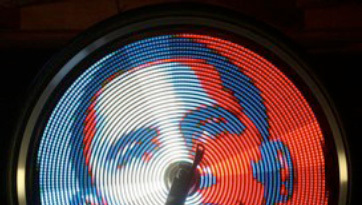 Do you always wonder where those bright colorful bike lights come from? The ones that change colors, shapes and patterns, and are attached to the wheels. Here is a great article that covers them. Oh, SF Bike Party is around the corner (this Friday) and if you need to deck out your bike, these lights are perfect for that and you can purchase them locally! 1. You hit the brakes and/or the driver realizes you’re there and hits their brakes, and you narrowly miss a cosmic collision. 2. Neither of you can stop in time or move out of the way and the next thing you know, you are flying into the side of a metal wall and then laying on the ground dazed, in pain, and hopefully still conscious. 3. You make the split second decision that you’d rather eat concrete than metal, so you kamikaze your bike into the sidewalk and go flying into God knows what. Unfortunately, we all know too well that this sort of scene plays out every day in the lives of cyclists everywhere. This phenomenon is known as “right hook” and if you’ve never been a victim of it, you know someone who has. Well, necessity is the mother of invention and seeing that we need a way to announce our presence to oblivious drivers in more ways than just visual, it’s about time that proper bike horns were invented. So, we’ve rounded up three promising bicycle accessories from Kickstarter, a crowd funding website where inventors can raise funds to develop their products, and have shared what we think about each of them. The first comes to us by way of our bike-friendly cousin to the north, Portland, Oregon. Orp is a bike horn and light combo that can generate two levels of noise: a polite low level noise and a loud level noise than can reach 96 decibels. They need to raise $90k and with 30 days left to go, they are a little more than 1/3 funded on Kickstarter. – It has a pleasant sounding lower level noise in addition to the loud one. Sometimes you don’t need to make such a loud racket which can be annoying to people and the lower level noise kind of sounds like a cute little bird chirping. – It has a bike headlight incorporated so then you can get two birds with one stone. – It looks easy to affix to your handlebars, seems easy to operate, and easily rechargeable with USB. – The founder seems to have extensive experience and knows what he is doing. – You get 5 hours of constant operating time per charge. If you are a daily commuter and/or ride a lot, you may need to charge it quite often. – Drivers may be confused and even freaked out (that may not be such a bad thing, hee hee) by the unusual sounding noise. – Field testing needs to be done- sure it can get up to 96 db but is it actually loud enough that drivers can hear it? Update (2/5/13) – Manufacturer of Linus Bikes are partnering up with Loud Bicycle to develop the bike horn. Yay! I believe this is the reason why the video was taken down. Honk back at those cars when they honk at you! Loud Bicycle lets you speak the language of the metal death monsters! This is a horn straight out of Boston, Massachusetts that actually sounds like a car horn. They’ve already raised more than $50k on Kickstarter and are now fully funded. Hooray for them! – Like they said in the video, a driver will understand a car horn sound when they hear it. – The opportunity to honk back at a driver if they honk at you. This is my favorite aspect. – A bit bulky and unattractive. It would be better if there was a bike light incorporated. – We don’t like the name “Loud Bicycle” that much because it doesn’t sound like the name of a bike horn or even a bike accessory. But I guess a rose by any other name would smell just as sweet? This one is not actually a bike horn, but we thought it was worthy of a mention. BLAZE is a bike light from London, UK that creates visibility for cyclists by projecting a laser bike image on the road a few feet ahead so that drivers will see it and know there is a bike nearby. It helps a lot with staying visible, even in a car’s blind spot. They were fully funded on Kickstarter when funding closed on December 23rd of last year. They raised 55k in sterlings. Hope we will see these in stores in The States as well as the UK. – The concept is really cool and original. – The light projected will definitely increase visibility and looks attractive too. – “Built in the UK and assembled by hand” and looks high quality. 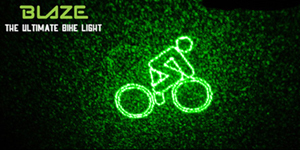 – Has a safety feature built in to prevent the damaging of people’s retinas with the laser- the laser symbol will not work unless it is mounted on a bike, but the LED light will still work. – Their Kickstarter video is relaxing. – Laser projection is not as visible in day light. – Battery on full charge lasts up to 6 hours in constant on mode. According to them, a commuter cyclist would only need to charge it once a week. That is still too frequent for us. Here is my personal take on the bike accessory called Bike Wrappers. What are Bike Wrappers you ask? They are removable and reversible safety wraps for bike frames and for $45 they come in a set of three. The first piece measures approx. 16” long and fits over the top tube; the second piece measures 18” long and is for the down tube; and the third wrapper is 9” long and fits over the seat tube. All three pieces come with a pattern on one side and a safety reflective on the other. They wrap around the frame with Velcro. There is an opening in the down tube wrapper to accommodate a bottle cage. A “preppy sweater” is keeping my bike warm this winter. On its reflective side, the short seat-tube wrapper exposes some of the Velcro overhang. I like that they are machine washable and easy to put on without any fuss. As a lifestyle cyclist living in a small condo, I like everything to be as simple as possible and these wrappers fit that. You don’t need to wear reflective clothing because these reflective wrappers will do the job. The down tube piece has an opening to accommodate bottle cages. They come in variety of pretty cool patterns and I am sure you can find one to your liking. The pattern I chose gives my bike a different look- like it is dressed in a warm and preppy sweater. They are definitely highly reflective. I could see my bike at least 200 feet away and beyond that, the bike would be too small to the naked eye anyway and drivers usually have their low beams on. That distance is plenty enough to get a motorist’s attention. They are made right here in San Francisco and that is great because I support local. Although it would fit on a mountain bike, hybrid or a BMX frame nicely, I think the seat tube piece (9” long) is too short for either a road or track frame’s seat tube. A longer wrapper would definitely help with the scratches from locking that area of the seat tube and rear wheel with a U-lock. In addition, when the reflective side of the seat tube piece is facing outwards, too much of the Velcro is exposed. It would be better if the bike wrapper pieces were sold separately and not as a set of three. Many cyclists like to only wrap the top tube. Doing so does not give the same visibility as having two or three, but it is more aesthetically pleasing. You will get an almost 360 view of the reflectives except for when facing the bike head on because of the head tube/front tire obstruction. This shouldn’t matter if you have front bike lights. If they start selling them in individual pieces rather than as a set of three, I would recommend them if someone is shopping for a bike wrapper and wants to increase visibility. In my opinion, having three pieces wrapped on the bike frame instead of just the top tube is a little tacky- like putting a sweater on a dog. I think it would be even better if the reflective was incorporated into the pattern on a single side. That would make it more convenient instead of having to flip the wrapper over for day or night use. It would also be cool to be able to customize the colors and patterns. Think of all the possibilities! You can buy them right here in SF at Sports Basement and other bike shops around town. They are also sold in stores across the country. Check their website for more info: www.bikewrappers.com. They are very reflective even from 200 hundred feet away. This close up photo shows how brightly it’s reflecting.